Absorption spectra including excitonic effects. This tutorial discusses how to calculate the macroscopic dielectric function including excitonic effects within the Bethe-Salpeter (BS) approach. Crystalline silicon is used as test case. A brief description of the formalism can be found in the Bether-Salpeter notes. The user should be familiarized with the four basic tutorials of ABINIT and the first GW tutorial. This tutorial should take about one hour to be completed. Before starting, you might consider to work in a different subdirectory as for the other tutorials. Why not Work_bs? so that we can analyze the input file while the code is running. The input file is located in $ABI_TUTORIAL/Input/tbs_1.in. The header reports a brief description of the calculation so read it carefully. Don’t worry if some parts are not clear to you as we are going to discuss the calculation in step by step fashion. # 1) Ground-state calculation to get the density. ngkpt  4 4 4         # This mesh is too coarse for optical properties. # Dataset2: definition of parameters for the calculation of the WFK file on the symmetric k-mesh. # Dataset3: calculation of the WFK file on the shifted k-mesh to break the symmetry. chksymbreak3 0             # To skip the check on the k-mesh. shiftk3    0.11 0.21 0.31  # This shift breaks the symmetry of the k-mesh. nfreqre4   1   # Only the static limit is needed for standard BSE calculations. # to the type(s) of atom. Here, the only type is Silicon. typat 1 1         # They both are of type 1, that is, Silicon. #%%  1) Ground-state calculation to get the density. This input file generates the two WFK files and the SCR file needed for the subsequent Bethe-Salpeter computations. The first dataset performs a rather standard ground-state calculation on an \Gamma-centered 4x4x4 grid (64 k points in the full Brillouin Zone, folding to 8 k points in the irreducible wedge). Then the ground-state density is used in dataset 2 and 3 to generate two WFK files with a standard NSCF run and the conjugate-gradient method. The \Gamma-centered k-mesh contains 8 points in the IBZ while the shifted k-mesh breaks the symmetry of the crystal leading to 64 points in the IBZ (actually the IBZ now coincides with the full Brillouin zone). The second mesh is clearly inefficient, so you might wonder why we are using such a bizarre sampling and, besides, why we need to generate two different WFK files! Indeed this approach strongly differs from the one we followed in the GW tutorials, but there is a good reason for doing so. It is anticipated that optical spectra converge slowly with the BZ sampling, and that symmetry-breaking k-meshes lead to faster convergence in nkpt than the standard symmetric k-meshes commonly used for ground-state or GW calculations. This explains the bizarre shift but still why two WFK files? Why don’t we simply use the WFK file on the shifted k-mesh to compute the screening? The reason is that a screening calculation done with many empty bands on the shifted k-mesh would be very memory demanding as the code should allocate a huge portion of memory whose size scales with (nband * nkpt), and no symmetry can be used to reduce the number of k-points. To summarize: the WFK with the symmetric k-point sampling and 100 bands will be used to compute the screening, while the WFK file with the shifted k-mesh and 10 bands will be used to construct the transition space employed for solving the Bethe-Salpeter equation. The two k-meshes differ just for the shift thus they produce the same set of q-points (the list of q-points in the screening is defined as all the possible differences between the k-points of the WFK file). This means that, in the Bethe-Salpeter run, we can use the SCR file generated with the symmetric mesh even though the transition space is constructed with the shifted k-mesh. After this lengthy discussion needed to clarify this rather technical point, we can finally proceed to analyze the screening computation performed in the last dataset of tbs_1.in. The SCR file is calculated in dataset 4 using nband = 100 and ecuteps = 6.0 Ha. 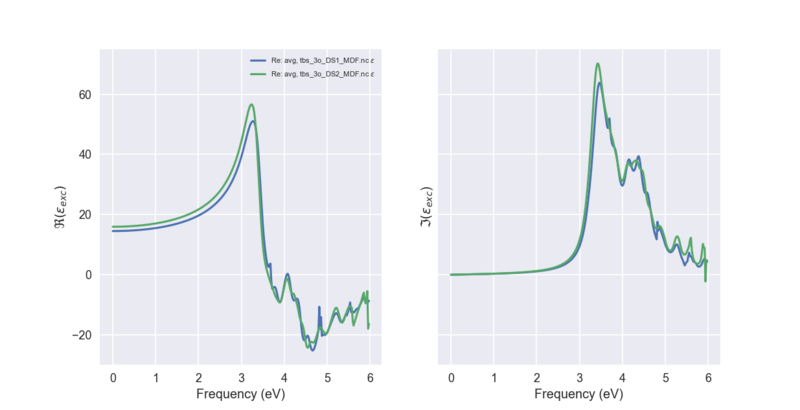 In the first GW tutorial, these values were found to give QP energies converged within 0.01 eV, so we are confident that our SCR file is well converged and it can be safely used for performing convergence tests in the Bethe-Salpeter part. nfreqre4  1   # Only the static limit of W is needed for standard BSE calculations. Indeed, in the standard formulation of the Bethe-Salpeter equation, only the static limit of the screened interaction is needed to construct the Coulomb term of the BS Hamiltonian. Using a single frequency allows us to save some CPU time in the screening part, but keep in mind that this SCR file can only be used either for Bethe-Salpeter computations or for GW calculations employing the plasmon-pole models corresponding to ppmodel = 3, 4. At this point the calculation should have completed, but there’s still one thing that we have to do before moving to the next paragraph. The list of k-points specified in the BS input files must equal the one used to generate the WFK file. Two new WFK files and a new SCR file must be generated from scratch if we want to change the k-point sampling used to construct the transition space. This section is intended to show how to perform a standard excitonic calculation within the Tamm-Dancoff approximation (TDA) using the Haydock iterative technique. The input file is $ABI_TUTORIAL/tutorial/Input/tbs_2.in. Before running the job, we have to connect this calculation with the output results produced in tbs_1.in. to create two symbolic links for the shifted WFK and the SCR file. The reason for doing so will be clear afterwards once we discuss the input file. This job lasts 1-2 minutes on a modern machine so it is worth running it before inspecting the input file. to put the job in background so that we can examine tbs_2.in. Now open $ABI_TUTORIAL/Input/tbs_2.in in your preferred editor and go to the next section where we discuss the most important variables governing a typical BS computation. # BS run: Tamm-Dancoff approximation solved with the Haydock algorithm. bs_calctype       1       # L0 is contstructed with KS orbitals and energies. mbpt_sciss          0.8 eV  # Scissors operator used to correct the KS band structure. bs_exchange_term  1       # Exchange term included. bs_coupling       0       # Tamm-Dancoff approximation. bs_freq_mesh 0 6 0.02 eV   # Frequency mesh. bs_algorithm        2      # Haydock method. bs_haydock_niter   200     # Max number of iterations for the Haydock method. bs_haydock_tol     0.05 0  # Tolerance for the iterative method. zcut               0.15 eV # complex shift to avoid divergences in the continued fraction. # MUST be equal to the grid used for generating the WFK file. ngkpt  4 4 4              # This mesh is too coarse for optical properties. shiftk    0.11 0.21 0.31  # This shift breaks the symmetry of the k-mesh. chksymbreak 0             # Mandatory for using symmetry-breaking k-meshes in the BS code. ecutwfn 8.0               # Cutoff for the wavefunction. ecuteps 2.0               # Cutoff for W and /bare v used to calculate the BS matrix elements. inclvkb 2                 # The commutator for the optical limit is correctly evaluated. #%%   BS run: Tamm-Dancoff approximation solved with the Haydock algorithm. The code expects to find an input WFK file and an input SCR file whose name is constructed according to prefix specified in the files file tbs_2.files (see this section of the abinit_help file). This is the reason why we had to create the two symbolic links before running the code. Then we have a list of five variables specifying how to construct the excitonic Hamiltonian. bs_calctype       1    # L0 constructed with KS orbitals and energies. mbpt_sciss   0.8 eV    # Scissors operator used to correct the KS band structure. bs_exchange_term  1    # Exchange term included. bs_coupling       0    # Tamm-Dancoff approximation. 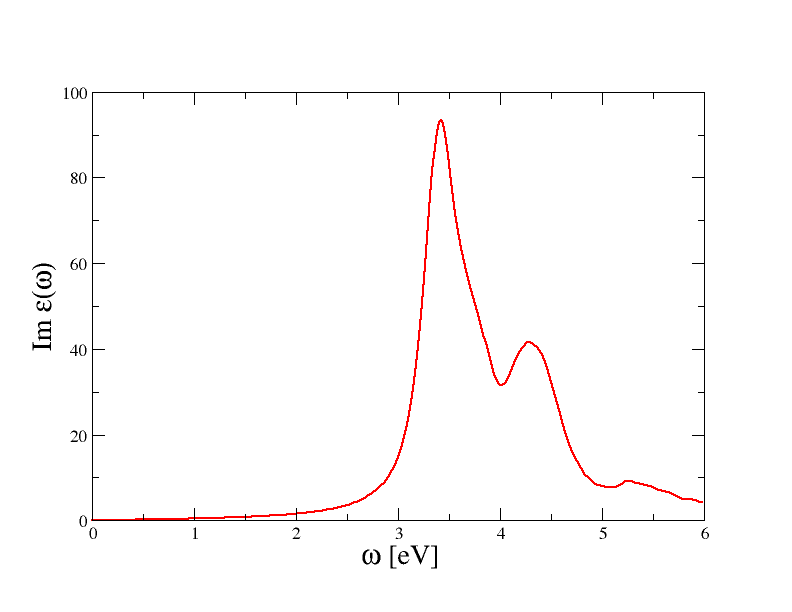 The value bs_calctype = 1 specifies that the independent-particle polarizability should be constructed with the Kohn-Sham orbitals and energies read from the WFK file. To simulate the self-energy correction, the KS energies are corrected with a scissors operator of energy mbpt_sciss = 0.8 eV. This permits us to avoid a cumbersome GW calculation for each state included in our transition space. The use of the scissors operator is a reasonable approximation for silicon but it might fail in more complicated systems in which the GW corrections cannot be simulated in terms of a simple rigid shift of the initial KS bands structure. The remaining three variables specify how to construct the excitonic Hamiltonian. bs_exchange_term = 1 tells the code to calculate the exchange part of the kernel, hence this calculation includes local-field effects. The variable bs_coulomb_term is used to select among different options that are available for the Coulomb term (please take some time to read the description of the variable and the relevant equations in the Bethe-Salpeter notes. Finally bs_coupling = 0 specifies that the off-diagonal coupling blocks should be neglected (Tamm-Dancoff approximation). This particular combination of parameters thus corresponds to a Bethe-Salpeter calculation within the Tamm-Dancoff approximation with local field effects included. In this case all the bands around the gap whose index is between 2 and 8 are included in the basis set. bs_freq_mesh 0 6 0.02 eV  # Frequency mesh. This triplet of real values defines a linear mesh that covers the range [0, 6] eV with a step of 0.02 eV. The number of frequency points in the mesh does not have any significant effect on the CPU time, but it is important to stress that the number of bands included in the transition space defines, in conjunction with the number of k-points, the frequency range that can be described. As a consequence bs_loband and nband should be subject to an accurate converge study. bs_algorithm        2      # Haydock method (this is the default value). bs_haydock_niter   100     # Max number of iterations for the Haydock method. bs_haydock_tol     0.05    # Tolerance for the iterative method. bs_algorithm specifies the algorithm used to calculate the macroscopic dielectric function. In this case we use the iterative Haydock technique whose maximum number of iterations is given by bs_haydock_niter. The iterative algorithm stops when the difference between two consecutive evaluations of the optical spectra is less than bs_haydock_tol. The input variable zcut gives the complex shift to avoid divergences in the continued fraction. From a physical point of view, this parameters mimics the experimental broadening of the absorption peaks. In this test, due to the coarseness of the k-mesh, we have to use a value slightly larger than the default one (0.1 eV) in order to facilitate the convergence of the Haydock algorithm. Ideally, one should perform a convergence study by decreasing the value of zcut for increasing number of k-points. The k-point sampling is specified by the set of variables. ngkpt  4 4 4            # This mesh is too coarse for optical properties. shiftk  0.11 0.21 0.31  # This shift breaks the symmetry of the k-mesh. chksymbreak 0           # Mandatory for using symmetry-breaking k-meshes in the BS code. The values of kptopt, ngkpt, nshiftk, and shiftk must equal the ones used to specify the grid for the WFK file. chksymbreak = 0 is used to bypass the check on symmetry breaking that, otherwise, would make the code stop. ecutwfn 8.0   # Cutoff for the wavefunction. ecuteps 2.0   # Cutoff for W and /bare v used to calculate the BS matrix elements. inclvkb 2     # The Commutator for the optical limit is correctly evaluated. specifies the parameters used to calculate the kernel matrix elements and the matrix elements of the dipole operator. We have already encountered these variables in the first GW tutorial of the GW tutorial so their meaning is (hopefully) familiar to you. A more detailed discussion of the role played by these variables in the BS code can be found in the Bether-Salpeter notes. The output file, tbs_2.out, reports the basic parameters of the calculation and eventual WARNINGs that are issued if the iterative method does not converge. Please take some time to understand its structure. How many transitions are included in the basis set? How many directions are used to evaluate the optical limit? What is the value of the Lorentzian broadening used in the continued fraction? After this digression on the main output file, we can finally proceed to analyse the output data of the computation. In what follows, we provide a brief description of the format and of the content of each output file. This binary file stores the upper triangle of the resonant block (the matrix is Hermitian hence only the non-redundant part is computed and saved on file). The BSR file can be used to restart the run from a previous computation using the variables getbsreso or irdbsreso. This restart capability is useful for restarting the Haydock method if convergence was not achieved or to execute Haydock computations with different values of zcut. getbsreso and irdbsreso are also handy if one wants to include the coupling on top of a pre-existing TDA calculation since the code uses two different files to store the resonant and the coupling block (BSC is the prefix used for the files storing the coupling term). It is a binary file containing the results of the Haydock method: the coefficient of the tridiagonal matrix and the three vectors employed in the iterative algorithm. It is usually used to restart the algorithm if convergence has not been achieved (see the related input variables gethaydock and irdhaydock). The RPA spectrum without local field effects obtained with KS energies and the GW energies, respectively (mnemonics: NLF stands for No Local Field, while MDF stands for Macroscopic Dielectric Function). Formatted file reporting the macroscopic dielectric function with excitonic effects. The EXC_MDF file contains the most important results of our calculation so it is worth spending some time to discuss its format. # Macroscopic dielectric function obtained with the BS equation. By default the code calculates the macroscopic dielectric function considering six different directions in q-space (the three basis vectors of the reciprocal lattice and the three Cartesian axis). It is possible to specify custom directions using the input variables gw_nqlwl and gw_qlwl. These results are not converged, we postpone the discussion about convergence tests to the next paragraphs of this tutorial. The most important feature of the spectrum is the presence of two peaks located at around 3.4 and 4.3 eV. To understand the nature of these peaks and the role played by the BS kernel, it is useful to compare the excitonic spectra with the RPA results obtained without local field effects. to plot the absorption spectrum obtained with the three different approaches. The final result is reported in the figure below. The RPA-KS spectrum underestimates the experimental optical threshold due to the well know band gap problem of DFT. Most importantly, the amplitude of the first peak is underestimated, a problem than is not solved when local-field effects are correctly included in the calculation. 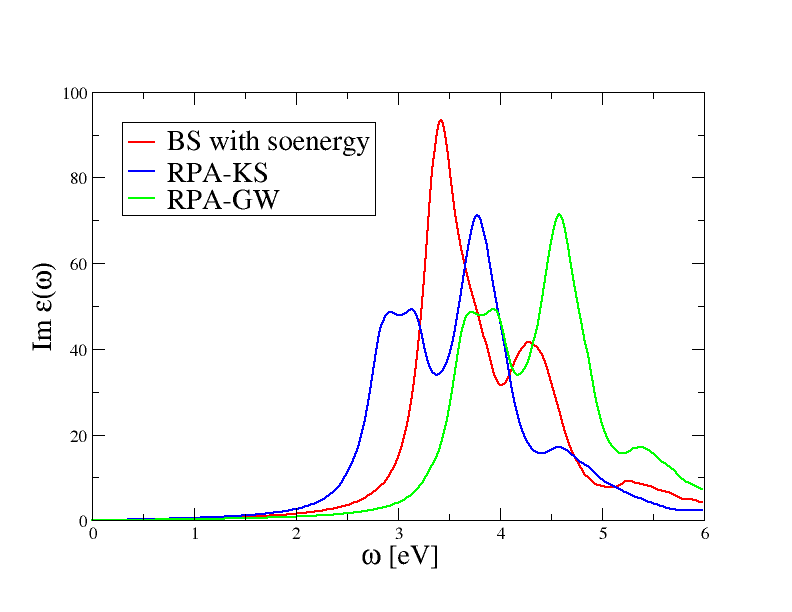 The RPA-GW results with QP corrections simulated with mbpt_sciss does not show any significant improvement over RPA-KS: the RPA-GW spectrum is just shifted towards higher frequencies due to opening of the gap, but the shape of the two spectra is very similar, in particular the amplitude of the first peak is still underestimated. On the contrary, the inclusion of the BS kernel leads to important changes both in the optical threshold as well as in the amplitude of the first peak. This simple analysis tells us that the first peak in the absorption spectrum of silicon has a strong excitonic character that is not correctly described within the RPA. Our first BS spectrum is not converged at all and it barely resembles the experimental result, nevertheless this unconverged calculation is already able to capture the most important physics. For further information about the MDF file and the post-processing tools provided by AbiPy, please consult the MdfFile notebook . Change the value of the Lorentzian broadening zcut used to avoid divergences in the continued fraction. Then restart the Haydock algorithm from the _BSR and _HAYDR_SAVE files using the appropriate variables. What is the main effect of the broadening on the final spectrum. Does the number of iterations needed to converge depend on the broadening? Use the appropriate values for bs_exchange_term and bs_coulomb_term to calculate the BS spectrum without local field effects. Compare the results obtained with and without local field effects. Modify the input file tbs_2.in so that the code reads in the resonant block produced in the previous run and calculates the spectrum employing the method based on the direct diagonalization (use irdbsreso to restart the run but remember to rename the file with the resonant block). Compare the CPU time needed by the two algorithms as a function of the number of transitions in the transition space. Which one has the best scaling? Since the memory requirements scale quadratically with the number of k-points in the full Brillouin zone times the number of valence bands times the number of conduction bands included in the transition space, it is very important to find a good compromise between accuracy and computational efficiency. First of all one should select the frequency range of interest since this choice has an important effect on the number of valence and conduction states that have to be included in the transition space. The optical spectrum is expected to converge faster in the number of bands than the GW corrections since only those transitions whose energy is “close” to the frequency range under investigation are expected to contribute. ecutwfn usually plays a secondary role since it only affects the accuracy of the oscillator matrix elements. We suggest avoiding any truncation of the initial basis set by setting ecutwfn to a value slightly larger than the value of ecut used to generate the WFK file. One should truncate the initial planewave basis set only when experiencing memory problems although this kind of problems can be usually solved by just increasing the number of processors or, alternatively, with an appropriate choice of gwmem. The value of ecuteps affects the accuracy of the matrix elements of the Coulomb term, the fundamental term that drives the creation of the excitons. As a consequence ecuteps should be subject to an accurate convergence test. As a rule of thumb, ecuteps can be chosen equal or, sometimes, even smaller than the value needed to converge the GW corrections. As already stated: optical spectra converge slowly with the Brillouin zone sampling. The convergence in the number of k-points thus represents the most important and tedious part of our convergence study. For this reason, this study should be done once converged values for the other parameters have been already found. Before running the test take some time to read the input file $ABI_TUTORIAL/Input/tbs_3.in. # Convergence of the number of bands in the transition space. bs_coulomb_term      10 # Coulomb term evaluated within the diagonal approximation. # MUST equal the grid used for generating the WFK file. #%%   Convergence of the number of bands in the transition space. The parameters defining how to build the excitonic Hamiltonian are similar to the ones used in tbs_2.in. The only difference is in the value used for bs_coulomb_term, i.e. bs_coulomb_term  10  # Coulomb term evaluated within the diagonal approximation. that allows us to save some CPU time during the computation of the Coulomb term. This job should last 3-4 minutes so be patient! Let us hope that your calculation has been completed, and that we can examine the output results. Note indeed that the above figure has been produced with more datasets in order to highlight the convergence behaviour. 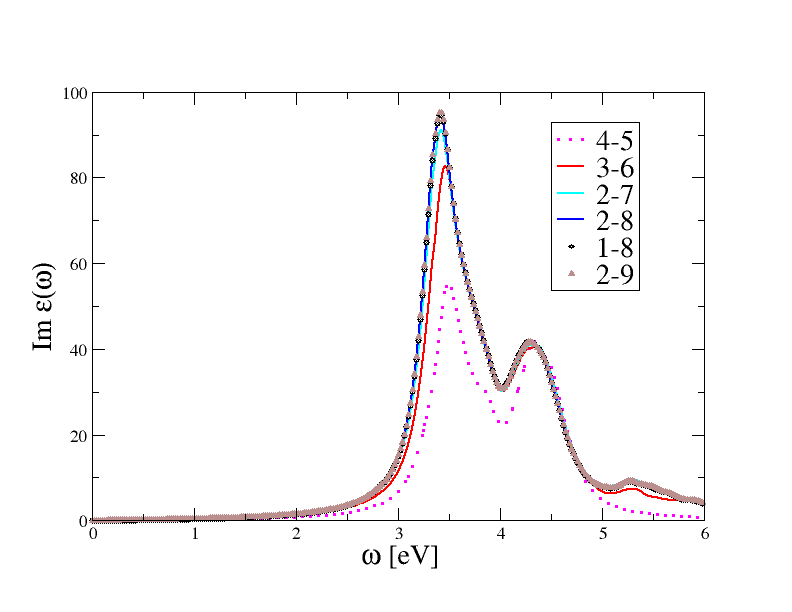 The results obtained with (bs_loband = 4, nband = 5) are clearly unconverged as the basis set contains too few transitions that are not able to describe the frequency-dependence of the polarizability in the energy range under investigation. For a converged spectrum, we have to include the three higher occupied states and the first four conduction bands (the blue curve corresponding to bs_loband = 2, and nband = 7). Note that adding the first occupied band, curve (1-8), gives results that are almost on top of (2,8). This is due to the fact that, in silicon, the bottom of the first band is located at around 12 eV from the top of the conduction band therefore its inclusion does not lead to any significant improvement of the transition space in the frequency range [0, 8] eV. For completeness, we also report the results obtained in a separate calculation done with bs_loband = 2 nband = 9 to show that four empty states are enough to converge the spectrum. We therefore fix the number of bands for the transition space using bs_loband = 2, nband = 7 and we proceed to analyse the convergence of the spectrum with respect to the number of planewaves in the screening. First of all, before running the calculation, take some time to understand what is done in $ABI_TUTORIAL/Input/tbs_4.in.